Ingredients for its daily menu are gathered from the market situated below, via direct connections between the producers and growers. Lunch & Dinner Mon.-Sat., Brunch Fri.-Sat. : Just above the farmers market’s dried fruit stands, organic vegetable vendors and artisanal cheesemakers sits Kitchen Market, the first formal producer-to-market restaurant in the city. Long wooden communal tables in the middle of the vast, open space are adorned with mismatched vases filled with rustic branches; smaller tables are placed against the wide windows that overlook the port and the Mediterranean Sea. French-trained chef Yossi Shitrit uses this flourishing environment as the stepping stone for his creative vision, incorporating the colors, textures and aromas of the ingredients into artful renditions of classic dishes with a Middle Eastern spin. The Market Salad comprises blue leaf lettuce, Dorblu cheese, beets and golden apples, while what we like to call the "Deconstructed Shepard's pie" is pieces of homemade tortellini filled with braised lamb nesting on a light potato purée and topped with peas and carrots, beef jus and truffle oil, showing the chef’s skilled technique and his wide knowledge of multiple cuisines. Desserts are as eye-catching as the savory courses: the glimmering yellow lemon tart sits inside the backdrop of the black clay handmade bowl, accompanied by a pale green geranium ice cream and garnished with yellow and black speckled flowers. The wine list presents some notable Israeli, French and South American labels, as well as Eliad, a vintage blend from Israel's renowned Chateau Golan Winery. 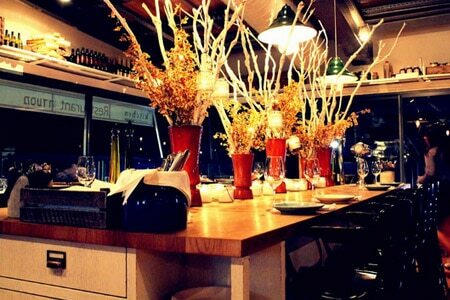 With its professional service, humble and refined cuisine, and scenic backdrop, Kitchen Market is completely pleasurable.